Preventing breast cancer the natural way. using entirely natural means to support the process: diet, exercise, visualization, meditation, and spiritual activity, mending negative relationships, group therapy. Medical treatment - surgery, radiation and chemotherapy - fail to stop the growth of cancer in the majority of cases; 50% eventually die of cancer, even after medical treatment. Medical treatment often destroys the body and it does not prevent recurrence. 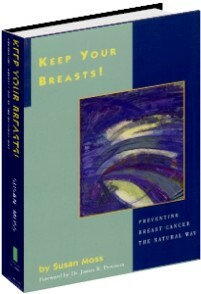 Order your autographed copy of Keep Your Breasts for someone you love today! Order your autographed copy of the book Keep Your Breasts and the newly released video.